A few months ago, my friend Michael and I co-founded Snact. That’s a portmanteau word for Snack and Act. What’s the ethos behind it? Making healthy snacks to tackle environmental and social challenges. It won’t come as a surprise that our current food system is wasteful. Globally, the figure is staggering: roughly one third of all the food we grow on this planet is wasted. And in the UK, it’s estimated that 20-40% of all fruit and vegetables are thrown away before they even reach the shops. 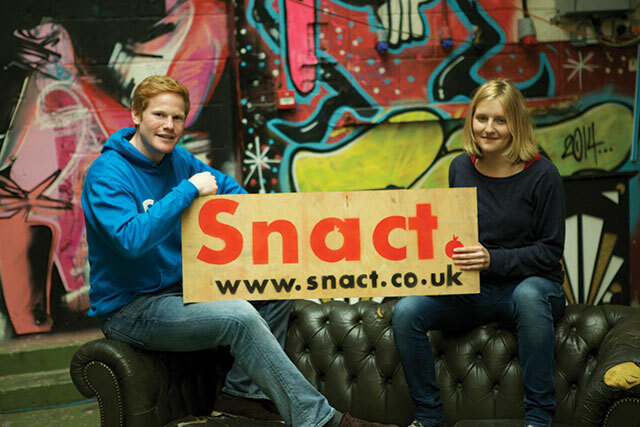 Discovering this, we decided to create Snact: a venture with environmental and social ambitions that tackles food waste and food poverty, as the latter is just scandalous with more than 900,000 people visiting food banks in the UK this year. Snact was launched with an ambition to tackle food waste — snactivism — and also because we wanted to create something that enables everyone to get involved — when you eat some of our Snacts, you are taking a bite out of food waste. At the moment we make fruit jerky, which are little pieces of dried blended fruit that pack so much fruity flavour your taste buds won’t know what hit them. We simply blend and dehydrate the surplus fruit we get, adding absolutely nothing, as we don’t believe that making healthy sustainable food should be complicated. And in fact, it’s not. Our 100% fruit jerky is a great way of preserving fruit, since we are taking something that is at the end of its life on the day of processing and extending it for months. We also see Snact as a tool to galvanise actions that create a better food system, and more generally, a more sustainable society. We imagine a world where the complex food systems that have arisen to meet our food needs are balanced by a different sort of sales model. We want to capture the margins that normally go to the middlemen in the food chain and redirect them to people affected by food poverty through our direct sales model. At the moment, our complex food chain means that many products bought at large retailers have huge margins added onto them, with the value extracted from these sales rarely going back to the right place. We see this as an opportunity to do it differently. We also see Snact as a tool to galvanise actions that create a better food system, and more generally, a more sustainable society. That’s why we want to become a Redbull for good — helping and supporting people and organisations running exciting projects in these areas. A few months ago, we supported a Donation run by giving snacts to runners and participating in the Brutal 10 challenge (well, Michael did). By participating he raised DoActions, which are small pledges that supporters commit to in order to make their lifestyles more sustainable. This summer, we’ll be providing Snacts for the Tolpuddle Pilgrimage. We’re still small so the amount of support is relative but as we get bigger, our ambition will remain. We’re on a mission to create a better food system but alone our efforts are meaningless and that’s why we’d like to invite you, and others, to become snactivists too. Whether that means eating our Snacts because you want something healthy to munch on, sharing ideas of exciting things we can support or simply spreading the message. It’s only by adding lots and lots of little actions that we’ll eventually get to something much bigger. Ilana Taub is co-founder of Snact. If you’d like to get in touch to share your ideas about what snactivism should look like or just want to say hello, we’d love to hear from you.